The RBI Annual Report generally has a lot of interesting charts and data that give good insights into the state of the economy. 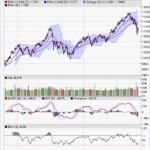 In this first of a series of posts, we cover five charts that we found quite informative from the latest report. The number and value of stalled projects, especially from the government side, has been coming down. Though new investments have not yet picked up meaningfully, we could start to see a return of pricing power for manufacturers and a revival of the capex cycle. 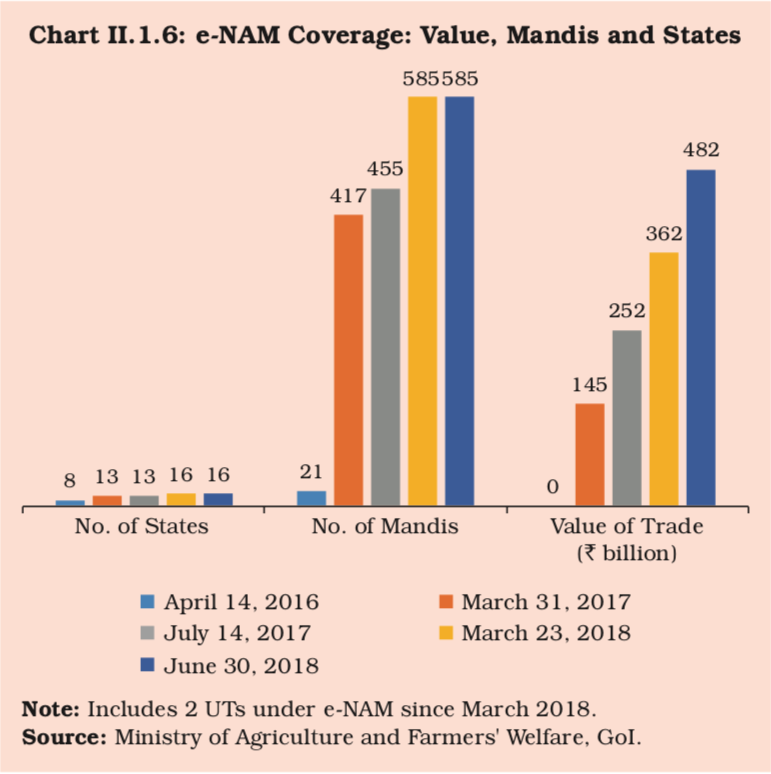 The scheme has immense potential to transform the agricultural marketing structure through smoother inter-state movements, more efficient price discovery and removal of intermediaries. 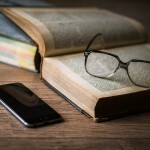 The adoption process, however, has been slow and gradual with a majority of traders/farmers still continuing with the manual auction method for selling their products. 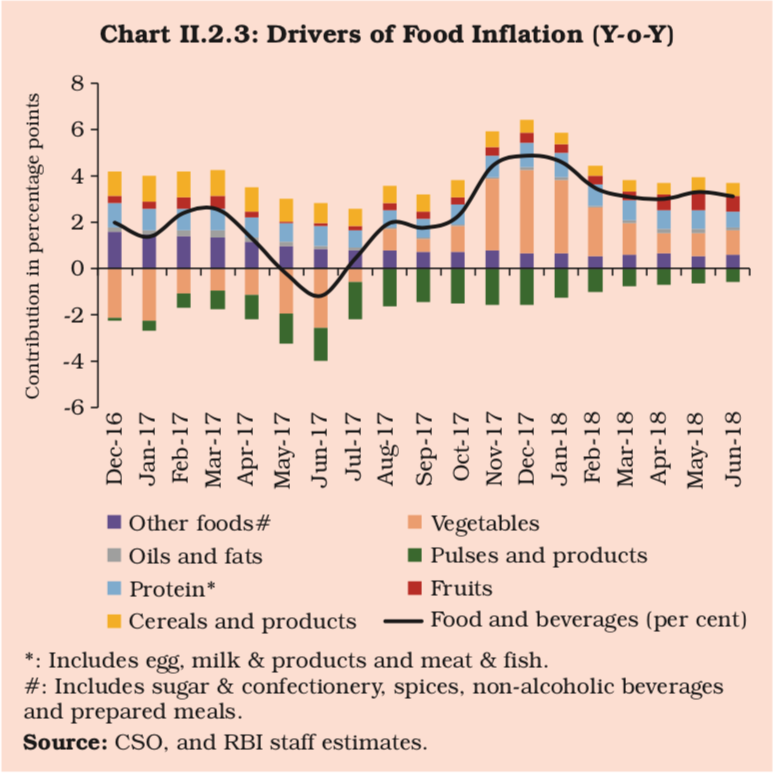 For 2017-18 as a whole, food and beverages (weight: 45.9 per cent in CPI) inflation moderated sharply, with its contribution to overall inflation dropping to 29 per cent from 46 per cent a year ago amidst significant intra- year variability. The softening in food prices, which began as early as in the second half of 2016-17 under the weight of a bumper crop and distress sales post-demonetisation, spilled into the first quarter of 2017-18, diving into deflation during May-June 2017 (Chart II.2.3). Two factors stand out in this plunge in food inflation: first, the unusually muted and delayed seasonal uptick in prices of vegetables ahead of the monsoon; second, a deepening of the deflation in prices of pulses since March 2017. The last few years have seen good monsoons, low global food prices and excess supply which have led to a deflation in food prices. 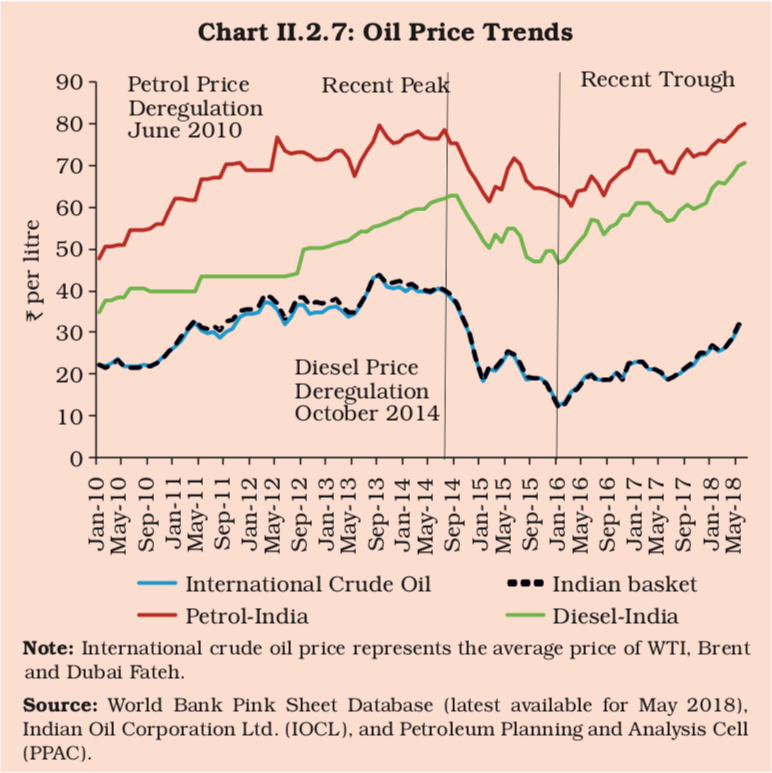 Diesel deregulation coincided with the global fall in oil prices. The government smartly increased taxes to shore up public finances. This is seen very clearly in the expansion of the spread between the international crude basket and prices at the pump. With oil increasing sharply in the last few months, it will be interesting to see if the government will maintain the current tax rates or if the spread will normalise. Credit growth was largely driven by private sector banks, which were resilient in the face of these tectonic shifts, with their credit portfolio growing at 18.7 per cent during the year as compared to 5.3 per cent by public sector banks (PSBs) and 3.8 per cent by foreign banks. Among PSBs, those under prompt corrective action (PCA) turned out to be laggards, though signs of revival were evident in this category as well during 2018-19 so far (Chart II.3.8). 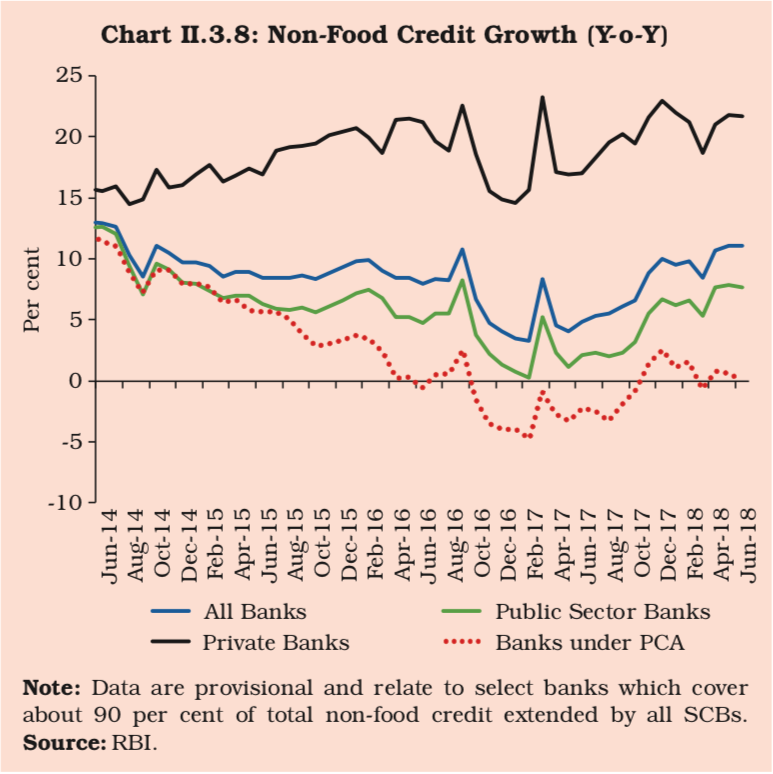 During Q1:2018-19, non-food credit has maintained its momentum, with credit accelerating to 12.9 per cent as on June 22, 2018 as compared to a meagre 6.3 per cent a year ago.